So this has been a week focused on digestion… yeah. It’s never a fun thing to have to think too much about, but such is my life. This morning I took a mental survey of anything that I could eat or drink that could possibly aid me in my gastro turmoil. It’s pretty well known that ginger does wondrous things for ailments, particularly the tummy. For some reason when I thought of ginger, I was reminded of an absolutely sublime fresh made ginger ale I had a restaurant a few weeks ago (I’ll tell you which restaurant in another post). As I gushed over the amazingness of the ginger ale, the adorable waiter we had was very proud to report that he had made it himself. Being unable to resist my overwhelming charm, he even told me how he made it. I was astonished by the simplicity of the process and warned him that I would steal it. Today, I have. And what I love is that it has all the freshness of real ginger, all the satisfaction of drinking a soda, and yet is perfectly healthy. Here’s what you do. Take a giant chunk of ginger, about the size of the one pictured here, and run it through a juicer. Now I know not everyone has a juicer and for those who don’t…. I got nothing, sorry. Pour 1 ounce of the juice into a 16-ounce glass. Add one tablespoon of raw organic agave syrup and mix thoroughly. Fill the rest of the glass with cold sparkling water or club soda (I used Pellegrino because I’m super classy). Voila. The freshest most refreshing ginger ale you’ve ever had, sure to help that upset tummy. 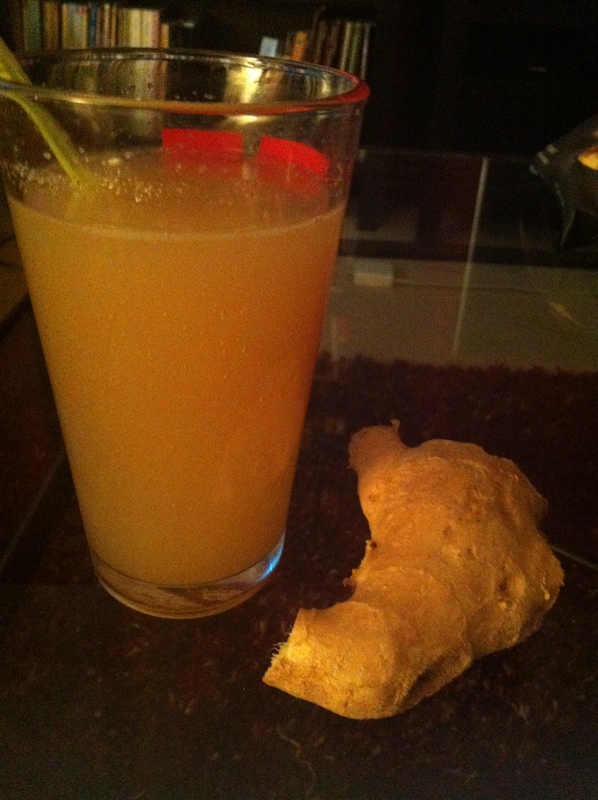 And please be warned, freshly juiced ginger is really really potent stuff. Like, it burns. No joke. So start with the ratio I’ve given you and feel free to make adjustments based on your own tastes. Also, I highly recommend adding fresh mint or some fresh lemon juice. Yum! I love ginger. I may just make this tomorrow night in place of wine. Having a healthy wine free week. Unfortunately an exercise free week too. How did that happen? Tomorrow is a new day, begin the begin.